← Opening This Weekend – 13 Most American Dreams! Cinematheque 5/17-19: The Uninvited, Le Havre, The Yellow Sea & more! 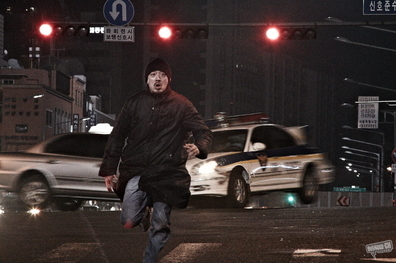 Surf waves of action and violence in epic South Korean thriller THE YELLOW SEA! Na Hong-jin, the South Korean director of THE CHASER, returns with another nerve-wracking, stomach-churning action epic! THE YELLOW SEA tells of a debt-ridden Korean-Chinese taxi driver who goes to Seoul to bump off a gangster and also look for his absent wife, who moved there to find work. But a chain of unexpected events sends him running for his own life. At last year’s Cannes Film Festival THE YELLOW SEA whipped the audience into a laughing, clapping frenzy — thanks largely to its thrilling, virtuosic chase sequences! Variety calls the movie “pulse-pounding, mordantly funny” but adds that it is “serious and full-bodied enough to achieve a genuinely tragic dimension.” Fasten your seatbelts on Friday or Saturday when we premiere it in a 35mm color & scope print! This entry was posted in arts, cleveland, film, ohio, shows and tagged art news, cars, CIA, Cinematheque, cleveland, cleveland institute of art, drama, entertainment, film, ohio, show, theater, theatre, transportation, travel. Bookmark the permalink.